Welcome to the virtual village of Wichamstow. The village, which if it keeps up this sort of growth will soon be a small town, is situated by the river Fisclacu. When the village has been deemed to be large enough to be officially called a town, it will have to put together a warship and crew to serve the King in times of war. If things should get worse, there is always a chance that he will also order Wichamstow to build a defensive earth bank and ditch around it with defended gates. The ditch would be about 2 metres deep, with a 2 or 3 metre bank, topped with a timber palisade wall of carefully arranged planks. Inside the palisade is a catwalk for the troops to defend themselves and the populous. If either of these projects has to be executed, it will all have to come from the locality and inhabitants, so it's not a popular step. It has three main roads leading to it, with the bridge across the river a little further upstream where the banks are a bit narrower. The largest town in the area is 25 miles away, which is a good days ride on horseback, and nearly two days if go by oxcart. Nobody, unless it's a sizeable group takes any shortcuts, as the woods are dangerous, and quite possibly have outlaws hiding from the Thegn in them. And it's not a good idea to accidentally surprise a female Wild Boar with her litter of young. Even on the roads, people try to travel in groups, and carry little bells and chatter loudly to announce their presence, after all, it's only the outlaws would want to hide their existence. The Fyrdsmen on horseback have bands of cloth around their arms to identify themselves, and who they are working for. The quickest way to travel is by boat or ship. The river is tidal still at this point, so you have to wait for the tide to carry you away with it, as there is no point wasting your energy rowing against it. Also, if the wind is blowing inland, your journey will be delayed, but usually, there is at least a breeze to get you off in the morning. The quayside is going to have to be extended further into the river, as the banks are being silted up. This is due to more and more land being ploughed, and over the winter months, or when there are severe rain storms, soil is washed out downstream clogging the banks. This may in the medieval period get so bad as to maroon the town preventing the bigger ships from trading, possibly 'killing' the town in the end. You stop for a drink at Duddas Drenchus (Dudda's Tavern). Find out about trade and prices at the market, particularly his prices, where you might meet Ðorvald ðe Scop (Storyteller). He is also quite good on the local gossip. At the church you could meet Ælfstan ðe Preost (Priest) who is also quite good on the local gossip. Travel to the quayside at ealden horswael pol. From there you may wish to take a ship along fisclacu, and then overseas to the lands of the Vikings and Normans or perhaps beyond, or sit down and be talked to by Styrbjorn ðe Scipwyrhta (Shipwright). 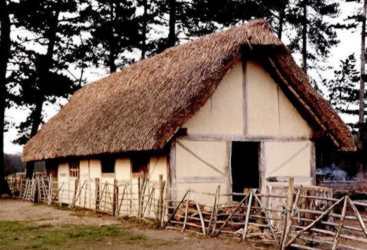 Leaving the village along the herepað (literally army path), you will arrive at the Manor of Drengham, where you can find about eorl Godwin's duties of law and order and military obligation, or the pastimes he indulged in. Travel further along the herepað and go to war with Eorl Godwin and his fyrdsmen (Soldiers). Travel the wealdweg to Swinwudu, where you might see much of the flora and fauna of the Old English countryside, or perhaps meet Ælfric ðe Colwyrhta (charcoal burner) going about his work. Travel far enough along the wealdweg and you may eventually reach the British kingdoms of Wealasland, or perhaps other settlements inhabited by other Anglo-Saxons. From the village you may wish to visit Leofmar ðe Mylenwyrd (miller) in his mill at Acmylen, and then perhaps cross Godabrycg and visit Abbot Wilfred at St. Werburg's Mynster, or carry on north along Langstræt where you will find yourself back in your own century with Regia Anglorum. 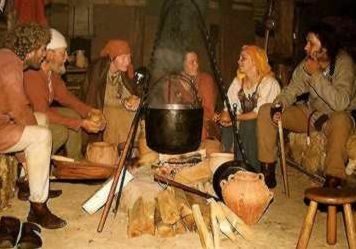 Travelling south down Langstræt you will pass Dunstan's farm at Linstede and on to places where you may find out more about the life and times of these people. Leave the village along Ægelesweg, past the old hill fort at Ealdburg, past the old burial mounds at Hlawdun and on until you reach a point where you can find out more about becoming a part of all this with Regia Anglorum. This village only exists on the web - however, we are currently constructing our own real village of Wychurst in Kent, England... follow the link for more details. Last updated 26 March, 2005. Article by Authors/Dates.